Four envelopes, numbered 2, 3 and 4, each containing a date, time and map reference, unsigned, but TARDIS blue. Who sent them? And who received the missing number one? 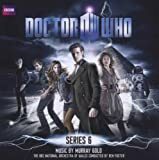 This strange summons reunites the Doctor, Amy, Rory and River Song in the middle of the Utah desert and unveils a terrible secret the Doctor's friends must never reveal to him. Placing his life entirely in their hands, the Doctor agrees to search for the recipient of the fourth envelope - just who is Canton Everett Delaware the Third? And what is the relevance of their only other clue: 'Space 1969'? Their quest lands them - quite literally - in the Oval Office, where they are enlisted by President Nixon himself to assist enigmatic former-FBI agent Canton, in saving a terrified little girl from a mysterious spaceman.